On the Final Day of competition in the 2019 Central Region A Championships in Canada, Elan Daley would capture another Three Gold Medals and break another Bermuda Age Group Record. During the Girls 13 Year Olds 200 LC Meter IM Preliminaries Daley would clock the fastest time of 2:29.12, Daley would then finish second competing in the Girls 13 Year Olds 100 LC Meter Backstroke Preliminary touching the wall in a time of 1:09.94. Daley would pick up a Gold Medal while swimming the anchor leg of the Etobicoke Swimming Girls 13-14 200 LC Meter Medley Relay team that clocked a winning time of 2:03.44. 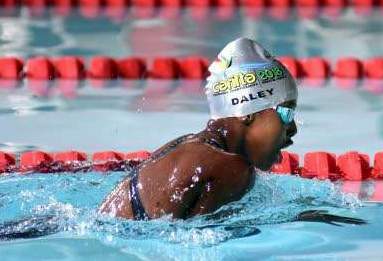 Daley would then capture the Gold Medal in the Girls 13 Year Olds 200 LC Meter IM A - Final with a time of 2:25.08 breaking the record previously held by Emma Harvey who clocked a time of 2:26.69 on March 24th 2016 during the XXXI Carifta Swimming Championships in Martinique. Daley’s final Gold Medal would come in the Girls 13 Year Olds 100 LC Meter Backstroke A – Final when she was clocked 1:06.81.